Predator animals who get into your chicken coops can cost you a significant amount of money by stealing eggs and harming your birds; not to mention omnivores who consume the food you put out for your chickens to eat. Your chicken coop is useless if you can't keep other animals out of it. Humans are not the only creatures who think chickens and their eggs make a tasty meal. If predators can access your chicken coop, your chickens will never be safe inside. 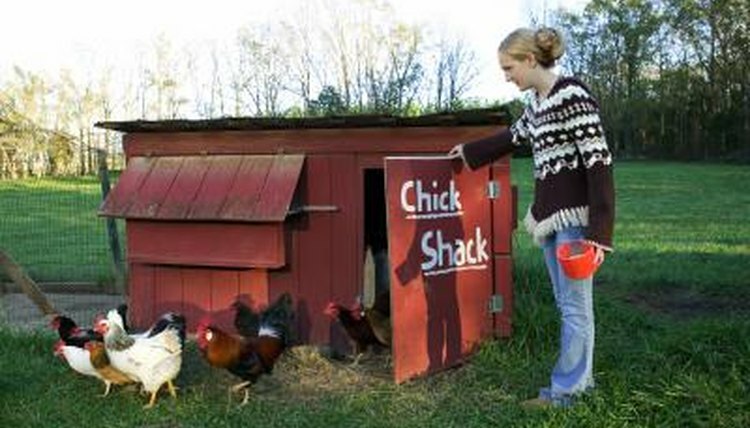 Have doors on your chicken coop or cage that you can open and close at will. Close the doors and any windows on your coop or cage at night to keep the chickens in and predators out. Placing mesh or wire with small openings around the perimeter of your chicken housing will keep your chickens in and other animals out. The smaller the openings on your wire mesh, the less likely it is that animals will be able to fit through it to access your coop or cage. Roosters provide good protection for hens. If you have a large group, put a rooster on the property to protect your hens from small animals and predators. Roosters can sound the alarm if a predator approaches the hen house. Some roosters will also physically fight to protect the hens. Chicken feed attracts bugs, insects, rodents and even some predators. limit the amount of feed you put out for your birds so you do not put out more feed than they'll eat before dark. Leftover feed attracts other animals, many of which will wait until after dark to emerge. If you do not have easily accessible feed laying around, critters are less likely to want access to your chicken's cage or coop.